Flue liner is actually a stainless steel flexible tube that is used to line the inside of a chimney to provide a robust and perfectly-sized passage for the combustibles from a solid fuel appliance (e.g. wood burning or multifuel stove). Definition: If the chimney is a Polo mint then the flue is the hole. 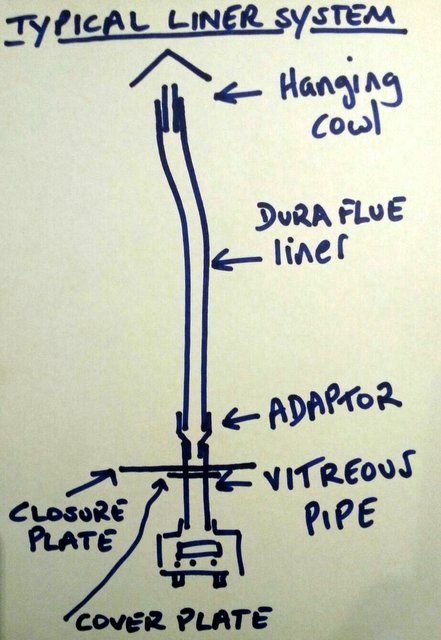 A flexible flu liner, stop it… flue liner (or “flexi” or “liner”) is a flexible stainless steel tube that is connected to the top of the pipe protruding from your wood burning stove and at the other end within the chimney pot (or attached directly to the cowl). It can be seen from this that smoke (and property damaging acids and tar) never come into contact with the inner walls of your chimney and can therefore also not escape through old/damaged building material and into the property where it can be a danger to occupants. A chimney liner may benefit from insulation. 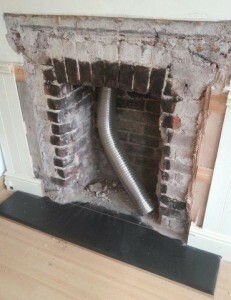 There are other methods of lining your chimney other than to fit a chimney flue liner but a flue liner is by far the cheapest and most common.A flue liner is not supposed to be in place of a suitable chimney or used if a chimney has fallen into a poor state of repair (if the chimney has faults they should be repaired professionally before lining). Flue liners are usually 5″ or 6″ diameter but can be larger. They are made of stainless steel in varying degrees of quality (316 grade or 904 grade with the 904 being higher quality).